No knowledge of genomics necessary! No experience with genomics? No worries! You don’t have to know anything about genomics. You won’t even have to learn anything about genomics. I agree to receive notifications relating to hackathons. Within the next 8 years, between 100 million and 2 billion human genomes will be sequenced including every newborn being sequenced at birth. This will generate more than 1 petabyte of new data every day and the world will soon be inundated with hundreds of exabytes of genetic data. Microsoft and Sequencing.com have been preparing for this inevitability by creating solutions that unlock the true value of genetic data. The Hack the Genome hackathon focuses on one of these unique solutions, Real-Time Personalization® (+RTP). On April 6-7, 2017, Microsoft Genomics and Sequencing.com will host the world’s first Hack the Genome hackathon. This exciting two-day competition will focus on developing health and wellness apps that provide a unique, personalized user experience. Competitors will use the Real-Time Personalization® (+RTP) API to add personalization to their apps. Apps powered by the +RTP API are able to perceive the uniqueness of each app user because the API allows any app to connect to and understand information obtained from the app user’s genes. 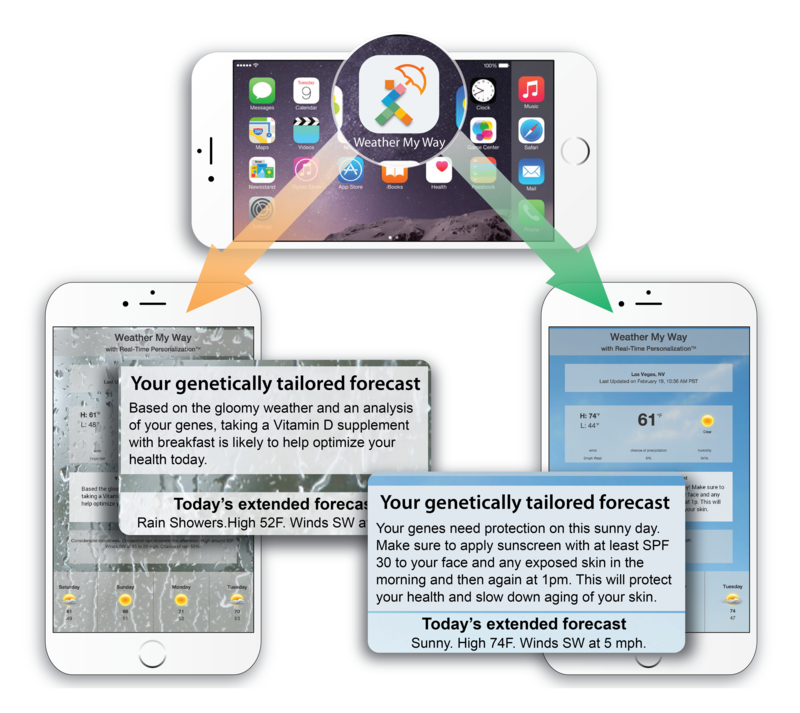 Apps powered by +RTP are able to utilize this gene-based information to provide personalized, real-time insights and guidance to the app user. There is no need to know anything about genomics as the +RTP API makes genetic-based information incredibly easy to work with and understand. All you need to know is how to create web or mobile apps. This hackathon is open to everyone who is enthusiastic about creating health and wellness apps that change lives and change the world. This includes all software developers as well as students, postdocs, ISVs and researchers. You may register as an individual or as part of a team composed of up to six people. Each team will create an app for iOS, Android, Windows Mobile or web utilizing the power of Azure. The first day will include presentations on the +RTP API including guidance on technical implementation. After the first day presentations and brief introductory sessions from Microsoft, the hackathon teams will spend the next 24 hours developing apps in the health and wellness category that use the +RTP API. This exciting competition will take place on April 6-7, 2017 at Microsoft's Headquarters in Redmond, Washington. Space is limited so register today if you are interested in competing. Free! There is no fee to register or compete. This exciting competition will take place on April 6-7, 2017 at Microsoft's Redmond Campus, Washington in Building 20. Space is limited so register today if you are interested in competing. What is required to participate in this hackathon? Participants will need to bring their own laptop. A working knowledge of coding (.NET/C#, Swift, Objective-C, Java, PHP, HTML, Python, etc.) is necessary to be successful in this hackathon. Experience developing UIs and optimizing UX may also be useful. Must be willing to commit to all two days of the event (April 6 and 7, 2017). No financial support for travel, lodging or meals is provided although drinks and snacks will be available. Does the app have to be developed for a specific platform? Apps can be developed for any platform including mobile (iOS, Android and Windows Mobile) or web. The +RTP API can also be used to power apps on any platform. I don’t know anything about genetics – can I participate in this hackathon? App developers do not need to anything about genomics and don’t need to learn anything new. The +RTP API is designed for the everyday app developer to be able to quickly integrate personalization into their apps on any platform including iOS, Android and Windows Mobile. What is Real-Time Personalization (+RTP)? Real-Time Personalization (+RTP) is a web service technology that enables software applications (apps) to provide context to data. Context refers to an app having the ability to comprehend the uniqueness and individuality of each app user. In essence, the app is able to use the information provided by +RTP technology to become cognizant of the app user as a unique individual. Empowered by Real-Time Personalization, apps can now implicitly understand whether data is relevant to the user as the data is generated in real-time. And with an app’s cognizance of the user comes the ability for apps to provide a truly personalized experience. How does the Real-Time Personalization (+RTP) API work? Sequencing.com performs incredibly fast genetic analysis ‘behind-the-scene’ to obtain the answer to the question. The answer, which is a simple ‘Yes’ or ‘No’ response, is then sent within milliseconds from Sequencing.com back to the app. This information allows the app to understand in real-time each app user as a unique individual. App developers can then configure the app based on the +RTP API responses. Sequencing.com is an online HIPAA and Privacy Shield compliant platform that transforms genetic data into meaningful information. It's the world's first platform that provides universal genetic-data compatibility, meaning it operates seamlessly with genetic data produced by any laboratory or company. The Sequencing.com platform includes an App Market that allows individuals, researchers, bioinformaticians and healthcare professionals to tap into genetic data for deep and rich insights. Sequencing.com also provides diverse resources for app developers, such as the +RTP API. Only teams that receive a formal invitation after registering for Hack the Genome will be allowed to enter the competition. Teams of 1-6 people are allowed. Each team will have 24 hours to create a mobile app that falls within the Health, Wellness and Fitness category. The app must be personalized to the app user by utilizing the +RTP API. The +RTP API can be used in any way the team desires. The app can be created for any mobile platform including iOS, Android or Windows Mobile. Team are allowed to use pre-existing code and open source code. Must be able to travel to Redmond, Washington (~30 minute drive from Seattle). Participants will need to bring their own laptop and any other hardware they need. Participants will be provided with their own Azure account as well as Azure credits that they can use during the hackathon to create their app. A working knowledge of coding (.NET/C#, Swift, Objective-C, Java, Python, etc.) is necessary to be successful in this hackathon. No borg or bots allowed. There will be six judges, three from Sequencing.com and three from Microsoft. Each judge will submit a score of 0-20 for each app and the scores will be added to obtain the Final Score for each app. There will be a first and second winner team as determined by the Final Score. In the event of a tie, both teams will win that award. For example, if there is a tie for second, both teams will win the award for second place. All participants will receive on-going executive-level support and technical assistance from Sequencing.com both during and after the hackathon.